...... It even allows you to join the selected titles or chapters and only output one file if you don't want to generate a separate file for every chapter or title. Designed specifically for Mac OS X A professional apple tv converter developed only for Mac PowerPC and Mac Intel (including Mac OS X 10.5 Leopard) users. 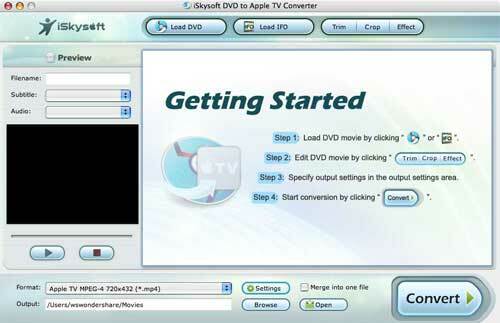 Convert DVD to Apple TV video and audio Besides converting DVD to Apple TV video files, This mac Apple TV Converter can also convert DVD audio to MP3 and M4A for playback on iPods or other audio players. Powerful encoding settings Set video encoding settings including resolution, frame rate, encoder, and bit rate, and set audio output settings including sample rate, channel, encoder and bit rate. Select DVD subtitle and audio track Convert your DVD to Apple TV with any available languages on your DVD by selecting the subtitle and audio track you prefer. Qweas is providing links to DVD to Apple TV Converter for Mac 1.6.37.7 as a courtesy, and makes no representations regarding DVD to Apple TV Converter for Mac or any other applications or any information related thereto. Any questions, complaints or claims regarding this application DVD to Apple TV Converter for Mac 1.6.37.7 must be directed to the appropriate software vendor. You may click the publisher link of DVD to Apple TV Converter for Mac on the top of this page to get more details about the vendor.